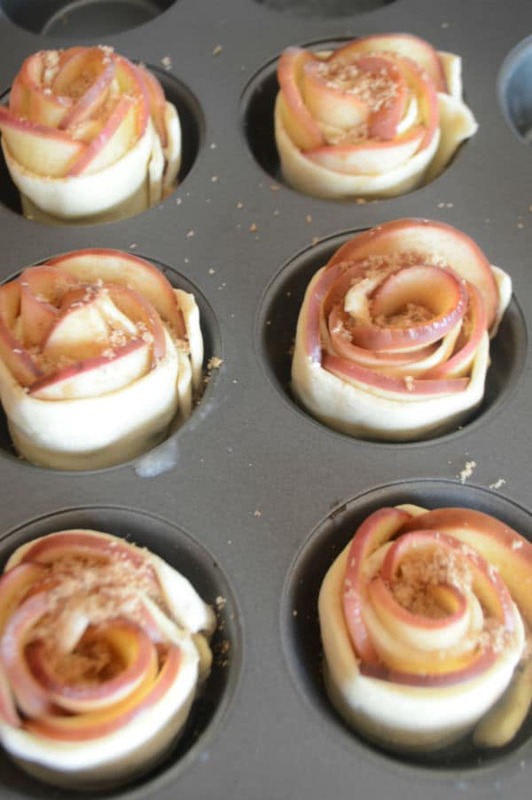 Rose shaped apple baked dessert, very attractive, fun to make and super delicious. 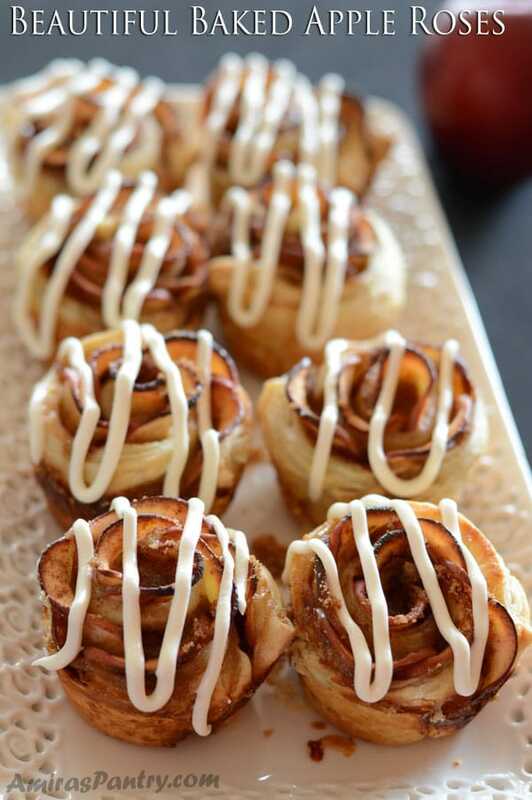 Puff pastry filled with cinnamon and brown sugar, rolled with slices of apple, baked and drizzled with some goodness. This is my new obsession, easy to make and very versatile. 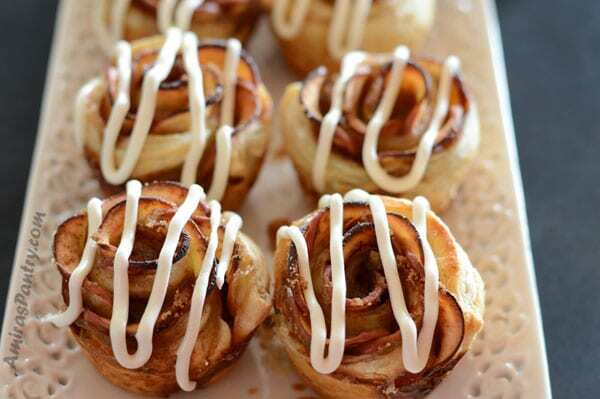 Fill with Nutella, cream cheese, jam or do as I did and filled them with apple’s best friend cinnamon and brown sugar mixture. 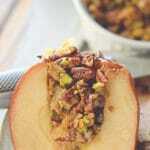 This filling is then caramelized when baked resulting in the wonderful and delicious sticky caramel. You can keep your roses plain with no added sauces, but to lure my boys more I’ve drizzled ribbons of their favorite cream cheese frosting. It was a very pretty easy dessert that I thank whoever created them first and I believe was the popular Chef John. So let me show you how I did those. 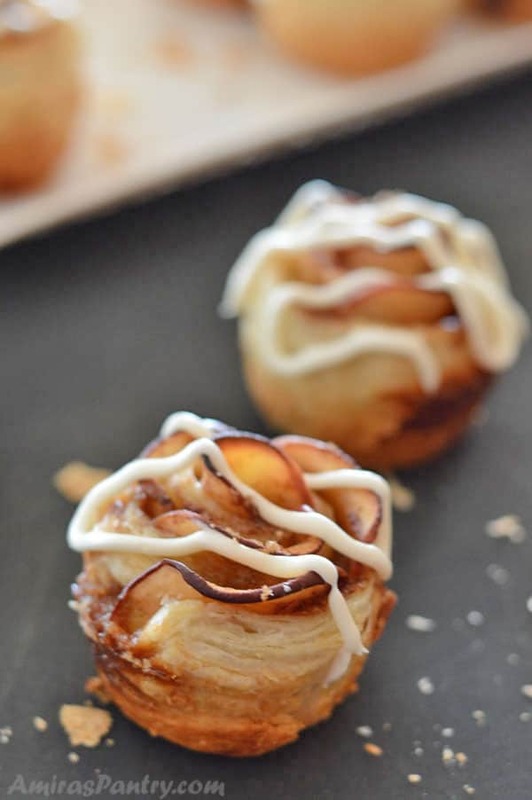 For a total of 8 roses – 4/each puff sheet- I’ve used two red delicious apples. 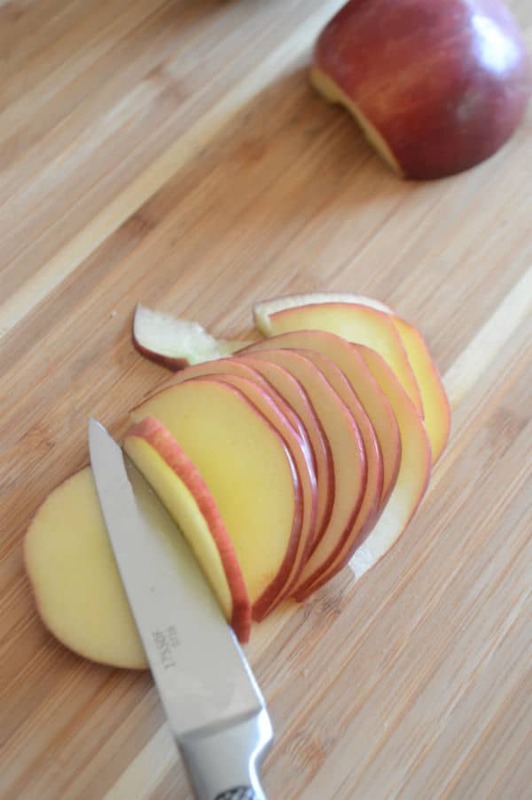 Thinly slice the apples. Mix apple slices with some lemon juice and water and microwave until tender. Meanwhile, make your sugar cinnamon mixture. 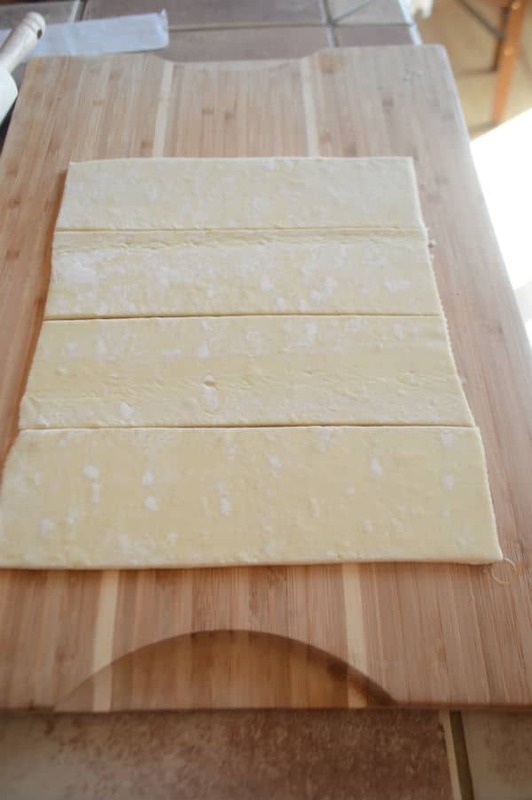 Cut your puff sheets into 4 equal parts. I’ve found that 4 parts makes big roses for my kids as it became hard for them to bite into it. So next time I might cut it into 5 or 6. 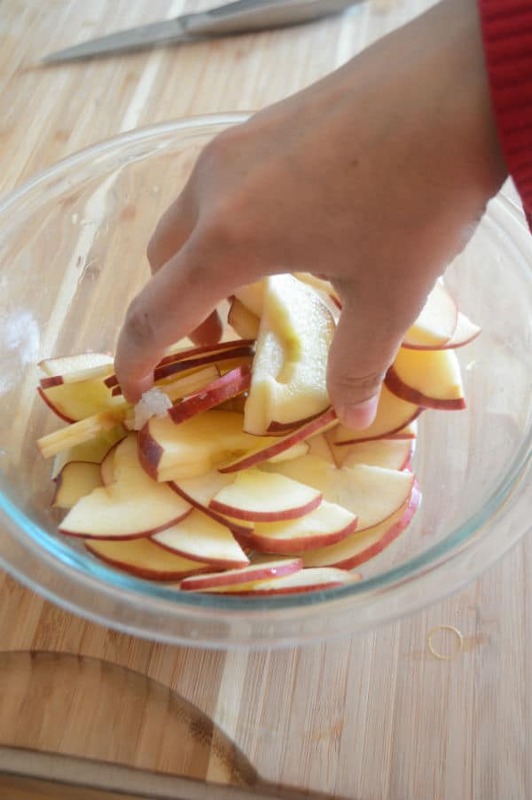 Brush with some melted butter, sprinkle two tablespoons- or more- of the sugar mixture and arrange apple slices. Until you reach the other end and you’ll get this beautiful rose. Place into the muffin tin, sprinkle top with the remaining of the sugar cinnamon mixture. 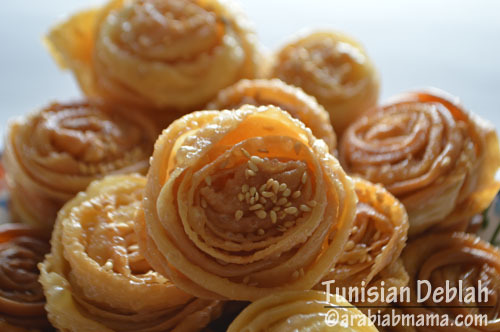 I went wild on this and when the sugar melted, it caramelized and it was so hard to get the roses out of the tin. Sooo, my advice to you is either sprinkle a little on the center of each rose or even better use cupcake liners. Bake as directed below, and watch out for it not to burn, this will depend greatly on your oven. Dizzle it with some caramel sauce or make cream cheese frosting found in my lemon cake recipe. Some people get annoyed by the fact that the roses gets out of the oven darker and the apples lose their color, which is obviously natural. This did not bother me, but if this is your case, you might want to loosely cover the muffin tin with foil to help prevent this a little. This is all I have for this beautiful recipe. 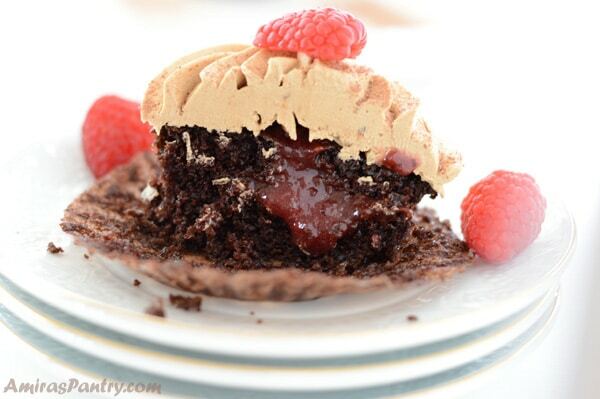 This is a kid friendly, adult frienldy, very pleasing to the eye and the tummy kind of recipe. And with spring approaching, this will be appropriate for any gathering. I hope you do like this recipe and I hope you’ll try it out… until next time.. have fun in the kitchen. 2 medium apples, cored and thinly sliced. 1 1/2 teaspoon lemon juice. 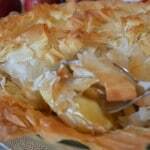 1 Package (two sheets) of thawed puff pastry. I’ve used cream cheese frosting, you can use any frosting you like or simply dust with some confectioner’s sugar. In a Microwave safe dish, place water, lemon juice and mix well, then add apple slices and microwave on high for two minutes until soften. 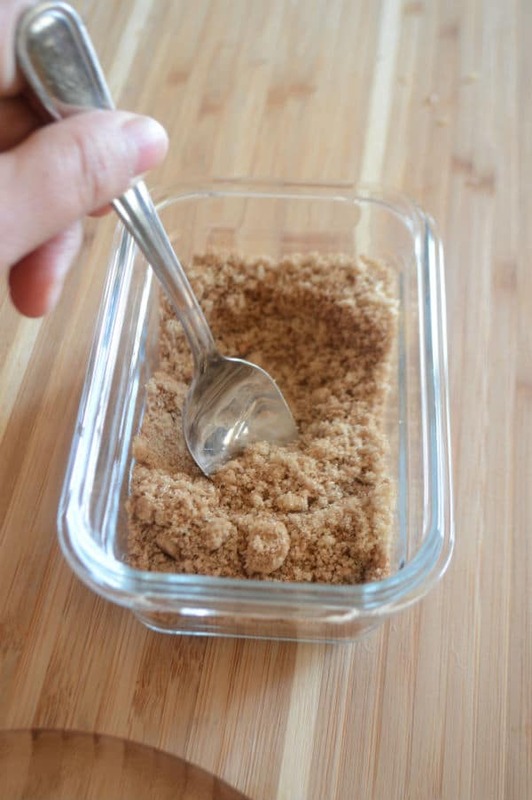 In a separate bowl combine brown sugar and cinnamon. 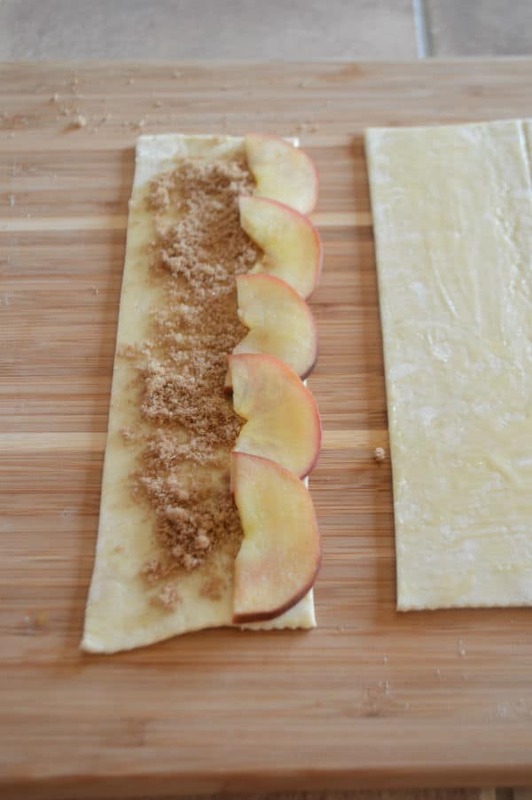 Brush each part with some melted butter, sprinkle about a teaspoon of the brown sugar mixture on. 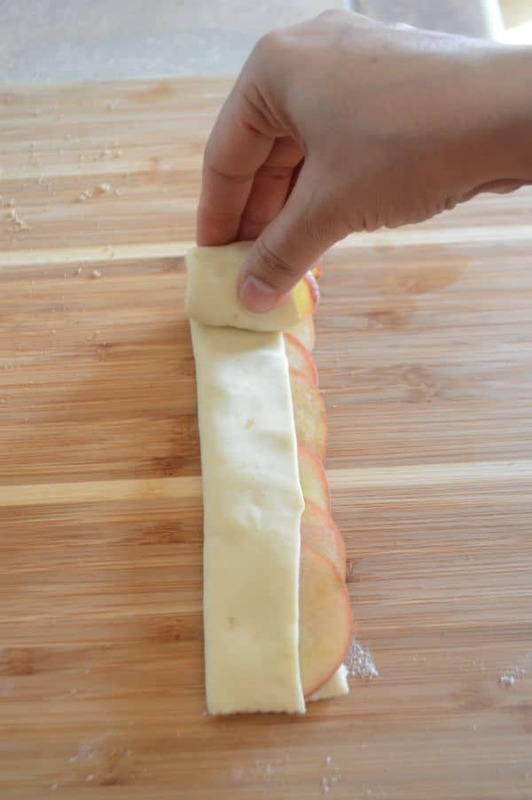 Layer the apple slices along the long edge of the dough, make sure that they are overlapping. Fold bottom part of the puff over the apples and roll. Bake until browned, mine took 40 minutes and were perfectly done. Put the frosting in a plastic bag and cut a small hole in the tip. pipe frosting over the roses or just dust with some powdered sugar. 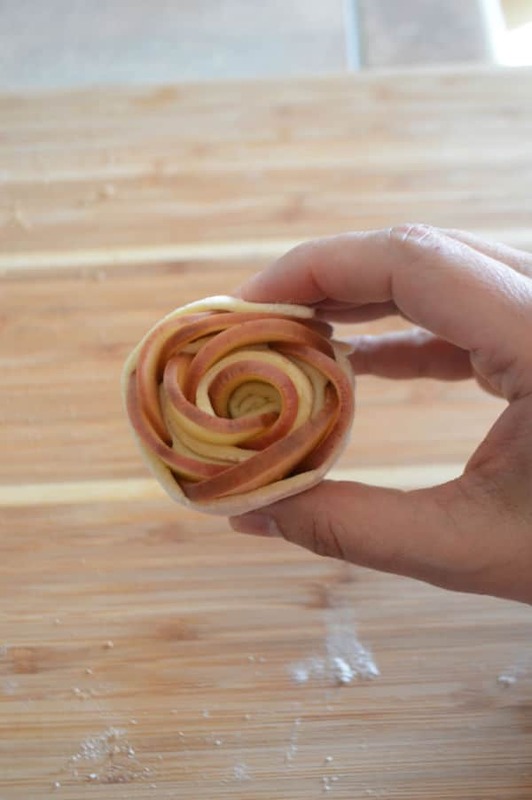 * I’ve found that cutting the pastry into 4 equal parts gave me somehow big roses so probably it is better to cut it into 5 or so. ** I’ve sprinkled the remaining sugar all over the roses , it was so delicious as the sugar melted on the sides and caramelized but I had a BIG problem which was taking the roses out of the muffin tin as it got stuck when the sugar melted.So better just sprinkle it on the middle or as I’ve suggested above use cupcake liners. Need more dessert recipes? check out the desserts here. Meanwhile here are some beautiful creations for you. Thank you Merryn:) let me know if you try it! I do need to try these! Have seen them many places but I am dying to eat one! 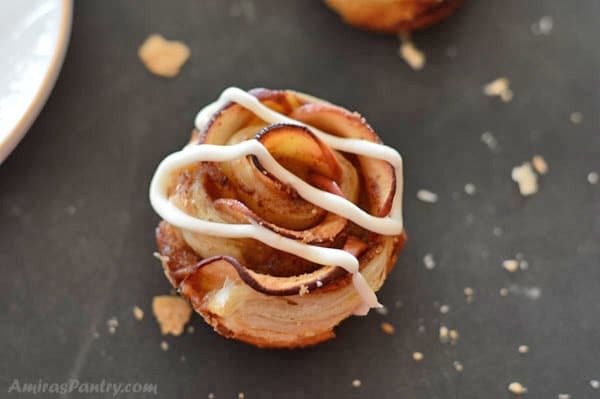 These apple roses are so adorable, Amira! You are very creative, can’t wait to try this! These are so pretty Amira. they hav ebeen on my bucket list for so long. I think you have the best how-to pictures I have seen too. Ironically I juts ate an apple bun a colleague bought at a local pasty shop lol. Pinned! Pretty! And tasty, I’ll bet. 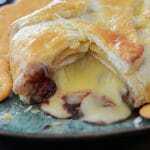 I need to stock up on frozen puff pastry — I usually have some in the freezer, but I’m out. Really nice recipe — thanks.